So the first, is that this morning, my granny, who is currently knitting the royal family, taught me the basic of knitting. Granny-ish thing to be able to do you may ask?! Ok, so I challenge you to go into Topshop and find a woolen sweater that had been knitted that you DON'T like. Believe it or not, it's just not going to happen. I know not everyone likes the Christmas jumper that there grandmother knits them, but I personally love them, as they are a one off piece that is unique. 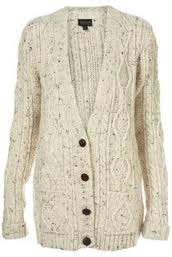 Also, boyfriend cardigans are lovely, and I particularly love the knitted ones Topshop do. Thank you, I'll follow you back if you like?